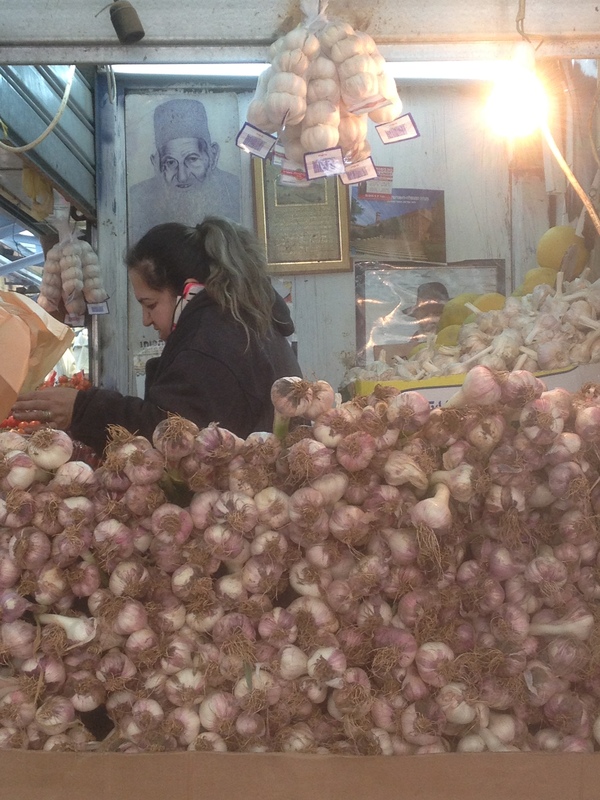 The vast majority of the produce sold in Israel, particularly in the shuk, is locally grown. 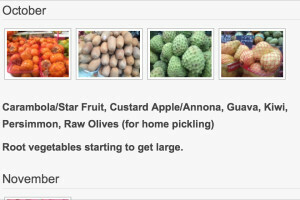 Thus it is also seasonal, and there are many times of the year that you simply cannot get certain fruits and vegetables. Of course, eating locally and seasonally is better for us and better for the world too. The food tastes better, it has lost fewer of its nutrients and we don’t have to pollute the world by transporting it from far distances. 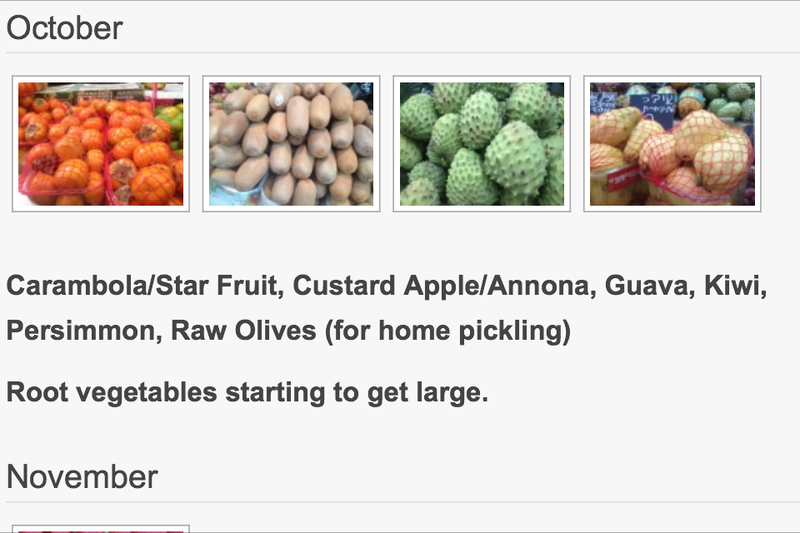 So one of the things I started doing a year ago was building a calendar of seasonal fruits and vegetables, so that I could know when to expect to find certain things at Machane Yehuda. Whenever I went to the market, I photographed things that I noticed as new in season. It is still a work-in-progress, but it is done to a large degree. So, I hereby present to you the Israeli Produce Calendar, a huge part of the overall Shuk Calendar! 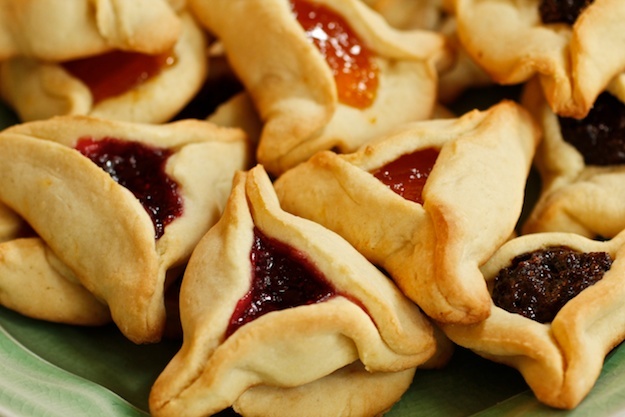 Special baked goods accompany the holidays of Chanukka (around December), Purim (around March) and Shavuot (late May-early June). The typical bakeries will have sufganiyot — fried donuts injected with all sorts of delectable fillings — for the former holiday. While bakeries around the country compete to deliver the most surprising and delicious gourmet fillings, in Machane Yehuda traditional flavors reign supreme. At some stores, potato pancakes (latkes or levivot) Come Purim, triangular filled cookies — called hamentaschen in Yiddish — fill the stands. Of course, in Israel they are referred to as oznei haman, “Haman’s Ears.” And since dairy foods are traditional on Shavuot, the bakeries serve up cheesecakes of various types before that holiday. While dried fruits and nuts are available all year, there is a wider array of abundance before the minor winter holiday of Tu B’Shvat, Jewish Arbor Day. It also coincides with the start of Fresh Almond Season (unless, like this year, there wasn’t enough early rain). 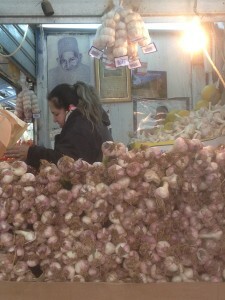 Before Passover, in the early Spring, fresh garlic appears in the market. As opposed to the dried garlic available year round, this is fresh, moister and extremely aromatic, with long stalks. I am not 100% clear on this, but I have heard the reason has something to do with a stringency some people have, fearing that the dried garlic may not be acceptable for eating on Passover. But chefs and foodies prefer the fresh since much of the dried garlic we get is chemically dried and imported from China. People buy large bunches of garlic, hang them to dry in their kitchens, or preserve them using other methods. Foods are not the only things that change with the holidays. Before Yom HaAtzmaut (Israeli Independence Day), a few weeks after Passover in the Spring, Israeli flags and other toys and trinkets for kids flood the market. After Rosh HaShana and Yom Kippur, in the Fall, a large area across Yaffo St. is set aside for the “Shuk Arba Minim” — the market where people can go to buy the four species (palm, citron, willow and myrtle) that Jews ritually wave on Sukkot. And just before Yom Kippur, the Jewish Day of Atonement, people practice kapparot. Though many prefer to enact this custom using charity money as a replacement, some Jews will have a chicken killed and then donate it to a poor person for a meal as a symbol of atoning for their sins. Though less common, it can still be seen around the shuk at times. 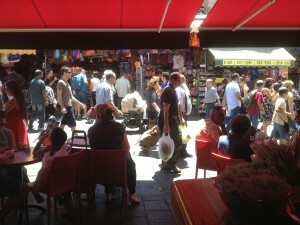 The shuk full of shoppers on a moderately busy afternoon. If you ask the masses, they will tell you to visit the shuk on Friday afternoon. And while I will agree that that is definitely an “experience,” and fun for some, I do not agree that it is the best time to visit. Even Friday morning is preferable, but there are even better times to visit. Any weekday, Monday to Thursday is good, and Thursday afternoon is like a mini-Friday. There will be people doing their Shabbat shopping then as well. Saturday is not worth a visit, since the shops are closed for Sabbath. And Sunday is the least busy of the other days, since many stores take it as their second day off. Still, because of this, Sunday can be the best time to explore, without too much crowding or bother. By the way, fish is not usually fresh on Sunday either, since the fishers also don’t typically work on Saturday. What about times of day? Morning is typically less busy than afternoons. Late in the afternoon, you can sometimes get cheaper prices on things the shopkeepers want to get rid of. Nighttime used to be completely dead in the shuk, but now that there are many bars that are open at night, many of the eateries also stay open. Now, what was once completely dead is happening and jumping with nightlife and energy! I have at least 3 more posts in this series on Machane Yehuda. 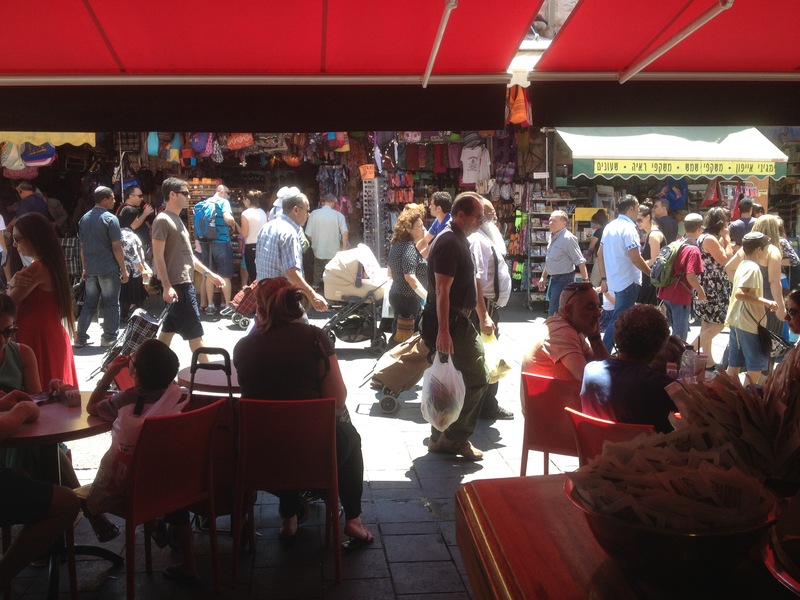 So if you have questions about Shuk Machane Yehuda, leave a comment below, or contact me directly. Joel – loving this series and the produce calendar is a brilliant idea. Surely your frustration that you can’t get most things throughout the year here as opposed to the US can be tempered by the fact that when they are available they taste far superior and for the most part cost much less? Really I enjoy it very much. Thanks for this creation. May, typically. But it may depend on in what context you are asking. he speaks about us living the words of the prophets……….how we will know when the Geula is on its way ?………..
.as the Navi says,……………………………. the earth will begin to bring forth it’s fruits….. etc. If you want to see Him . go to Shuk Machane Yehuda!!!! Thanks Bayla! And yes, you mentioned that before. It is a good quote!